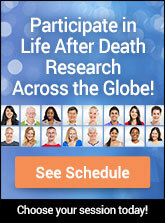 Get answers to some of the most basic questions about life after death, NDEs, dreams, past lives, and much more. Just click a question below to see suggested readings that may give you answers to the afterlife question of interest. We have hand picked a small group of books for each of these questions that we think may be good starting points in your quest to understand and discover more about life after death and related subjects. If you need more specific subjects, try the Personal Guide or Category Browse. This section will be greatly expanded with more questions. If you have a question which you would like to see appear here and to which we can respond with the appropriate reference materials, please click here.